Once a year we journey out in the search of apples and pumpkins. Usually we end up paying some astronomical amount of money in the neighborhood of $25 for a single bag of apples just for the joy of being able to labor in the fields ourselves and pick them. Such is the life of the insufferable yuppie. Since we had approximately three dozen apples from the farm share that I turned into apple sauce last weekend we opted to skip the apples this year and head straight for the pumpkins. It was fortunate that our new suburban life brings us in much closer range to the farms one needs for such activities. Our first stop took us to Hilltop Hanover Farm. It just so happened that it was their last day of pick your own vegetables. It also happened to be pouring rain and located at the end of a muddy trail. 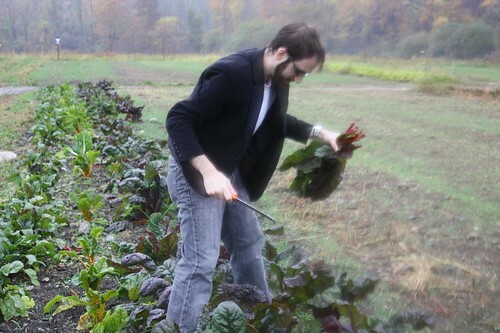 The man at the farm was very nice and gave me a handful of tiny bags and a mud-crusted knife so that we could hack our selected vegetables out of the ground. We couldn't help but notice that despite the listing on this website which has apparently remained unchanged since 1996 they did not have any pumpkins. This site has been our guide for the past five years and this was the first time it had failed us. Our second stop wasn't actually a stop but a drive by Amawalk Farm which displayed a sign that read "Closed For The Season." Our third stop took us to Muscoot Farm which, aside from having a silly name, was an amazing place with donkeys, pigs, chickens, roosters, and a ten-year-old boy who had the ability to talk to animals. They also had a huge pumpkin patch which was surrounded by a fence which was chained up and locked. 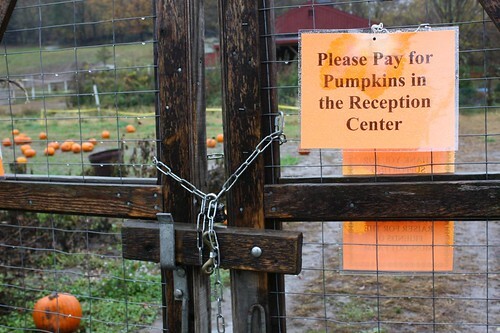 There was a barn-like building which claimed to be the area to pay for pumpkins with several loose pumpkins lying around. In desperation we left a $20 bill and took a large pumpkin and a sugar pumpkin for cooking. After a late lunch at The Blue Dolphin Diner, which had been recommended by a friend and was pretty excellent, we stopped by Sgaglio's Marketplace to pick up some sweet Italian sausage for dinner. Let me just say that this market was pretty amazing. I wish I lived in Katonah to be able to frequent this market and possibly overdose on its rustic charm. 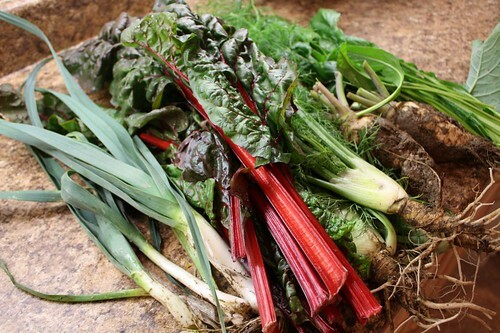 First we went through our bounty: from Hilltop Hannover Farms: fennel, chard, leeks, rutabaga, and mizuna. 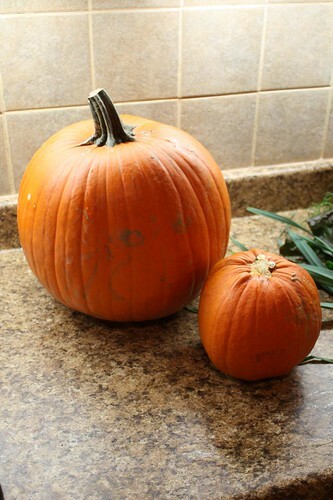 From Muscoot: one cooking pumpkin and one carving pumpkin. 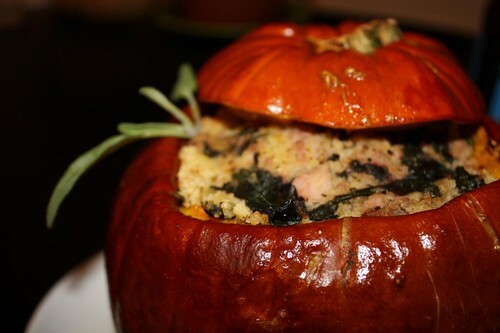 You may recall that last year we made my mother's traditional Stuffed Pumpkin, a dish I am accustomed to eating this time of year. This year I decided to try something a little different, mostly due to a lack of ground beef at home. 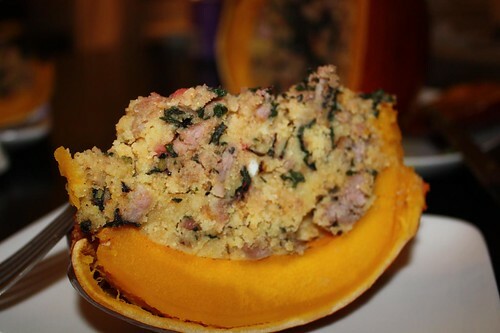 This year I stuffed the pumpkin with a stuffing made from onion, garlic, fennel, chard, sweet Italian sausage, cornbread, and sage. The result was pretty delicious. I felt a little guilty bastardizing my mother's recipe until I tasted the end result. We'll see how impressed I am with myself after I also eat this stuffed pumpkin for the next six consecutive meals. Wish me luck.